We are fascinated by the flowing waters that drain the Earth’s surface and by the aquatic organisms adapted to these dynamic environments. A key ecological challenge is to understand ecosystem-level consequences of declines in the abundance and biodiversity of aquatic organisms, given the alarming rate of river deterioration throughout the world. A major research theme of our lab is how stream ecosystems are altered by different types of disturbance, ranging from dams to disease to changes in land-use and climate. Understanding the complexities of species-community-ecosystem linkages and how they are modified by disturbance requires a fundamental understanding of biogeochemical interactions and involves the integration of two major sub-disciplines of ecology: community ecology and ecosystem ecology. Our research is characterized by long-term collaborative projects that are site-based in both temperate and tropical ecosystems. An over-arching objective is to link research activities with conservation through resource management applications, synthesis, and environmental outreach. Research areas include: hydrologic connectivity; conservation ecology; landscape ecology; climate change; ecology-evolutionary (eco-evo) dynamics; restoration; community ecology; and ecosystem ecology. Our lab has a history of in situ experimental research in streams. We developed an experimental electric exclosure technique to isolate top-down effects of stream macroconsumers (e.g., fish, crayfish, shrimps) on ecosystem properties and processes by excluding them from foraging on the stream bottom (Figs. 1 & 2). This technique results in exclusion of macroconsumers at a local scale, and is particularly effective when combined with (or nested within) reach-scale experimental manipulations. 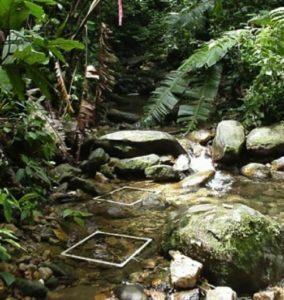 We initially implemented this technique in our studies in Puerto Rico and Costa Rica, and it has since been used in stream studies across the world. 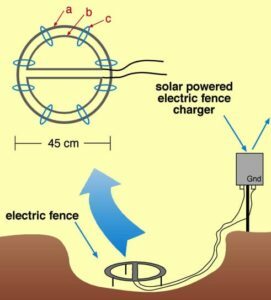 Schematic diagram illustrating electric exclosure technique designed for experimental exclusion of macroconsumers from stream benthic areas (modified from Pringle and Blake 1994).